The UCC congratulates former UCC National President Orysia Sushko on being named one of the “25 most influential women in North America” by the organization Women of Influence. This is a highly esteemed honour to receive and we thank Orysia for all her work and are very proud of this achievement as it represents the tremendous community accomplishments, at home and abroad that our fellow Ukrainian Canadians have made in representing our identity. 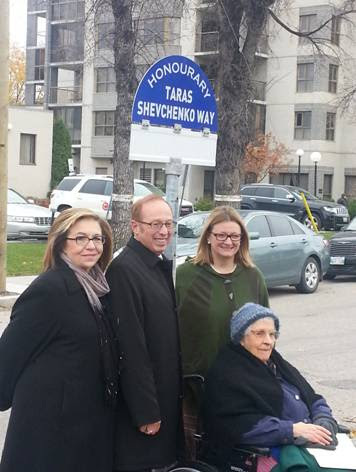 Winnipeg – The official naming ceremony of the honourary “Taras Shevchenko Way” took place on October 17, 2014. The City of Winnipeg designated a one-block stretch of Aberdeen Avenue, between Main Street and the Red River, to be known as Honourary Taras Shevchenko Way. The ceremony was MC-ed by City Councillor Paula Havixbeck. Former mayor Sam Katz brought greetings on behalf of the City of Winnipeg. Councillor Havixbeck was instrumental in getting this portion of Aberdeen renamed. The UCC is pleased to congratulate James Temerty on receiving the Omelian Kovch award. The award is conferred on individuals for contributions to ecumenical dialogue, dialogue of cultures and peoples, inter-religious and inter-ethnic understanding, for charity work and personal life example of sacrifice and humanism. Mr. Temerty is a philanthropist, and founder of the Ukrainian Jewish Encounter Initiative (Canada). During the last decade in Ukraine he has implemented a number of projects, including: organized an exhibition of jewelry “Scythian Gold of Ancient Ukraine” at the Royal Museum of Ontario, released a deluxe edition of Shevchenko’s “Kobzar”, and “Atlas of Mineral Resources of Ukraine” in English, established the Business school of Kyiv-Mohyla Academy, funded the projects of the Canadian “Children of Chernobyl” Fund, organized a campaign to raise funds for the activities of Ukrainian election observers and assisted to 500 observers during the Orange revolution and the 2004 presidential election, founded the charitable program “Children’s Hospital of the Future” in which James Temertey became a member of the Board of Trustees and allocated 1 million to the project. He organized an exhibition at the Royal Ontario Museum titled “Ancient Ukraine: the puzzle of Tripoli culture”. 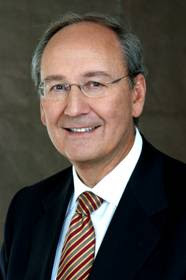 Since May 2010, Mr. James Constantine Temertey has been the chairman of the Advisory Council of the Ukrainian Canadian Congress. Maria Matviyiv, a doctor who saved the wounded during the tragic events of the Euromaidan (Revolution of Dignity). 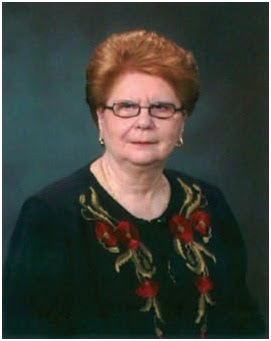 For over 22 years she has been working as a doctor in Lviv Health Care and Disaster Medicine regional center in the city of Busk, Lviv region. Archbishop Józef Michalik, former head of the Polish Bishops’ Conference (Poland). On June 28, 2013 in Warsaw, along with Head of the UGCC Sviatoslav (Shevchuk), Archbishop Mieczyslaw Mokrzycki, Archbishop Metropolitan of Przemysl-Warsaw Martynyak he signed a declaration of reconciliation between the Polish and Ukrainian peoples. Kyiv – A EuroMaidan Toronto project will deliver Kobo e-books to hospitals and orphanages in the regions of Sumy and Chernivtsi. This was stated at Ukraine Crisis Media Center by Clint Martin, the Senior Trade Commissioner at the Canadian Embassy in Ukraine, Oleksandr Romanko – a EuroMaidan Toronto activist and Olexiy Kaspruk the mayor of Chernivtsi. EuroMaidan Toronto was founded by Ukrainian-Canadians during the beginning of the Maidan movement in Ukraine, and now works on numerous projects to support Ukraine during this difficult time. In Canada, there are more than 1.3 million Ukrainian Canadians. Many of these individuals are very active in supporting Ukraine from abroad, raising money to support the Anti-Terrorist Operation (ATO) in the east by providing defensive gear and medical supplies. Many Ukrainian-Canadians are also involved in spreading awareness of the conflict in Ukraine throughout Canada. “The Euromaidan Toronto Committee is working on a number of projects to help Ukraine such as collecting money for the ATO, collecting money for internally displaced persons, promoting Ukraine in mass media, and assisting the Ukrainian government in projects,” stated Romanko. The e-book project is the next joint effort to support wounded Ukrainian servicemen and disadvantaged children. 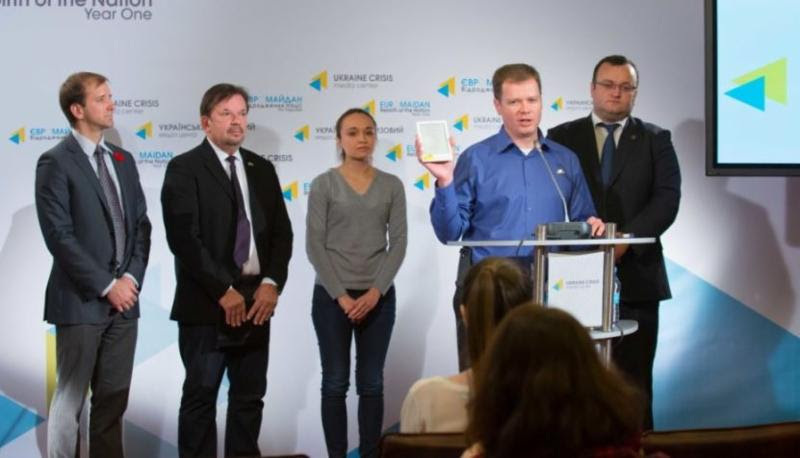 The project will deliver 2,000 e-books to hospitals with injured servicemen and to orphanages in Ukraine. Included in the e-books are classics, fiction, and contemporary literature in three languages. However, activists believe that the costs are worth the results. “Books can cure,” said Romanko. The Canadian Embassy has pledged its support to EuroMaidan Canada’s efforts, helping to promote these activities. “We will continue to support Ukraine as the situation changes here,” said Martin. As the project also brings together Ukraine’s different regions, such as Sumy and Chernivtsi, the efforts of EuroMaidan Canada also promote the country’s unity. “Not only is it meeting a great need in the present situation but it is also creative in meeting a need here in Ukraine,” he added. Київ – Євромайдан міста Торонто планує надіслати у подарунок електронні книги Kobo до військових госпіталів та дитячих будинків у Сумах та Чернівцях. Про це розповіли спеціальний уповноважений з питань торгівлі посольства Канади в Україні Клінт Мартін, активіст Євромайдану Торонто Олександр Романко, та міський голова Чернівців Олексій Каспрук на прес-брифінгу в Українському кризовому медіа-центрі. Євромайдан Торонто був заснований канадськими українцями після початку Майдану в Україні, і тепер займається численними проектами, щоб допомогти Україні у ці важкі часи. У Канаді є понад мільйон людей, що вважають себе українцями. Чимало з них дуже активно підтримують Україну з-за кордону, збираючи гроші для проведення Антитерористичної операції на сході, та закупаючи захисне спорядження та медикаменти. Також чимало канадських українців долучаються до поширення інформації про конфлікт на Донбасі у своїй країні. «Комітет Євромайдан Торонто працює над багатьма проектами з допомоги Україні – збирають гроші для АТО та біженців, просувають Україну в ЗМІ, допомагають українському уряду в його роботі» – зазначив пан Романко. Дарунок електронних книг буде ще одним спільним проектом для підтримки поранених українських військових та дітей-сиріт. Цей проект – досить дорогий, ціна питання складає приблизно 100 тисяч доларів США, а 2000 електронних книг будуть передані пораненим військовослужбовцям у госпіталях та дитячим будинкам. Проте активісти переконані, що витрати не будуть даремними. «Книга може лікувати» – вважає Олександр Романко. В електронні книги вже завантажені твори класичної, художньої та сучасної літератури трьома мовами. Посольство Канади пообіцяло підтримку волонтерам Євромайдану Канади, допомагаючи поширювати інформацію про їх роботу. «Ми продовжимо підтримувати Україну, відстежуючи зміну ситуації» – зазначив Клінт Мартін. Оскільки проект об’єднує різні регіони країни – Суми та Чернівці – діяльність Євромайдану Канади сприяє єдності України. «Це не просто зустріч, яка сьогодні надзвичайно потрібна, а й можливість проявити творчі здібності для тих, хто хоче допомогти Україні» – додав дипломат. Подивитися на відео, click here. The 1st Vice President of UCC National Renata Roman, a Registered Physiotherapist, is joining the Medical Mission to Ukraine which is comprised of doctors, nurses and health care professionals from Canada who are dedicating their time and expertise to treating and caring for the Ukrainian soldiers and the many injured on the Maidan. 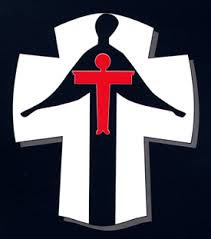 The mission is supported by the Canada Ukraine Foundation and Operation Rainbow Canada, under the patronage of the Ukrainian Canadian Congress. A medical team ofover 20 is comprised entirely of volunteers and includes plastic surgeons, a neurosurgeon, an upper extremity/micro-surgeon, anesthetists, a physiotherapist and nurses. The team will treat post-traumatic deformities such as facial and skull defects and deformities, burn scar contractures, scars, upper extremity defects and deformities. Funding for the mission comes largely from “United for Ukraine”, a fundraiser organized by the Canada Ukraine Foundation in September, attended by Prime Minister Stephen Harper and Wayne Gretzky. 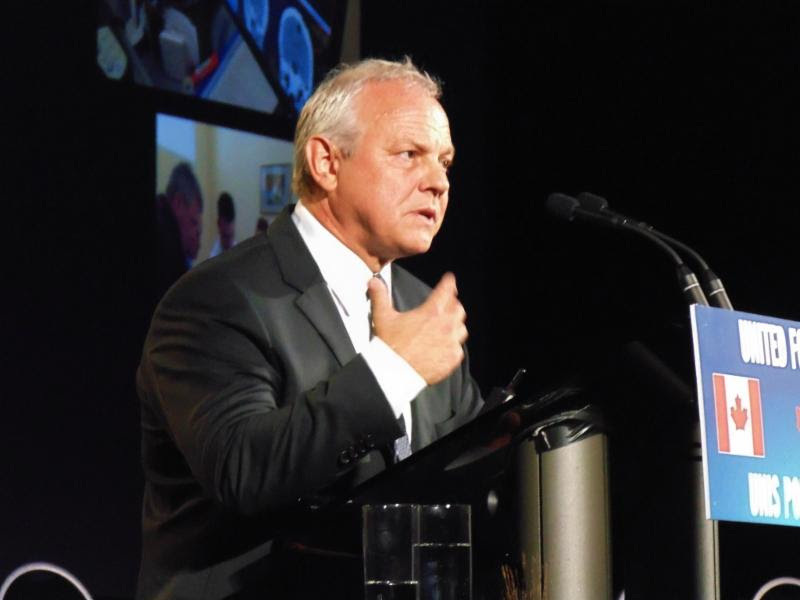 The Toronto fundraiser was attended by almost 1200 people and raised upwards of $200,000. The UCC National Office, in conjunction with the Embassy of Ukraine in Canada and the Canada Ukraine Parliamentary Friendship Group, is holding a Commemoration on Parliament Hill. On Thursday November 19, 2014 several MP’s will be participating as well as His Excellency Vadym Prystaiko Ukraine’s Ambassador to Canada. A moment of silence and reading from the Book of Memory will take place in addition to the prayers and speeches, to honour all those that perished at the hands of the Soviet regime and recognizing this heinous crime against the Ukrainian people as an act of Genocide. 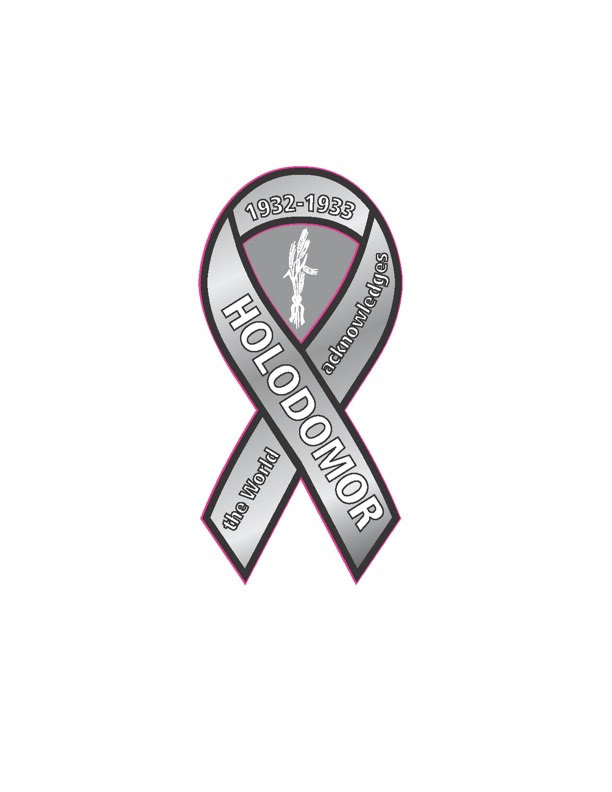 For the first time in Ottawa, a movie screening titled “Holodomor: Ukrainian Genocide” will be held, with remarks by VIP guests MP James Bezan and Professor Roman Serbyn. The screening will be followed by an award ceremony for outstanding contributions in recognition of Holodomor as Ukrainian genocide. 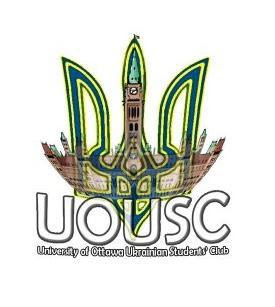 Organized by SUSK Ukrainian Students Club of University of Ottawa. Open to general public. Everyone welcome! Reception following movie. In 1991, Ukrainian Canadians marked 100 years of Ukrainian settlement in Canada. The Saskatchewan Provincial Council of the Ukrainian Canadian Congress decided to honour Ukrainians in this province. 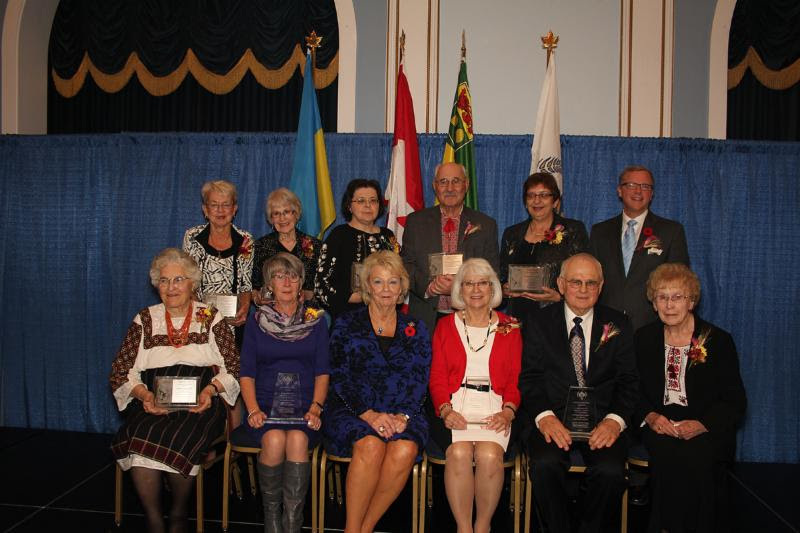 In 1995, the Nation Builders Awards were established and have been bestowed on those who have made meritorious contributions, which have had a significant impact; left a legacy; and/or provided an exemplary role model to the Ukrainian community and/or Saskatchewan-Canada. 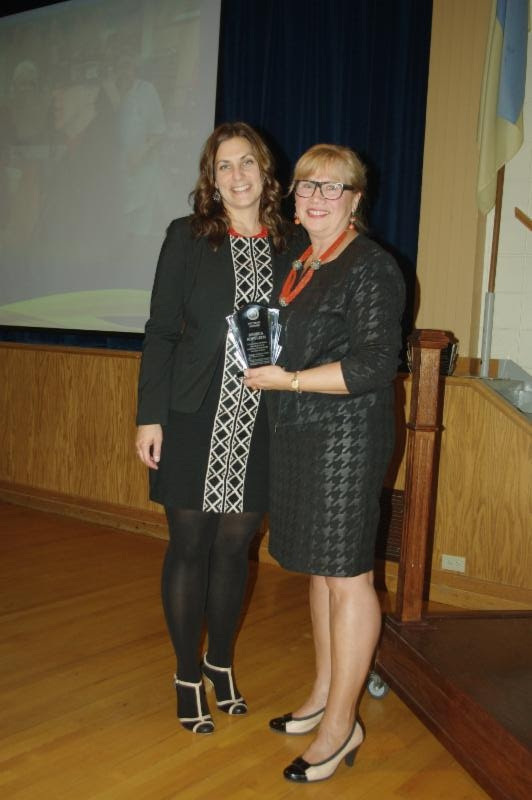 In 2005, as part of UCC-SPC’s Saskatchewan Centenary celebration, this prestigious recognition program was enhanced by the establishment of a second award, the Community Recognition Award. Community Recognition Awards are bestowed upon persons who have made meritorious contributions in one or more of the areas of youth achievement; leadership; volunteerism; cultural preservation & development; and/or creativity & innovation to the Ukrainian community and/or Saskatchewan-Canada. 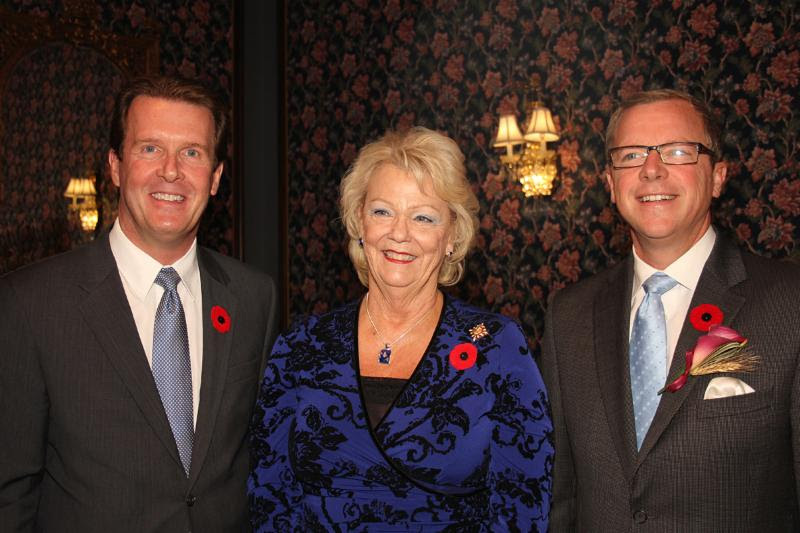 This year, the UCC-SPC Recognitions Committee inaugurated a new award titled Newsmaker of the Year which they awarded to Premier Brad Wall and the Government unwavering support for the people of Ukraine and the Ukrainian community of Saskatchewan. The Ukrainian Canadian Congress would like to offer the most meritorious congratulations to all recipients for their hard work and dedication to our community. 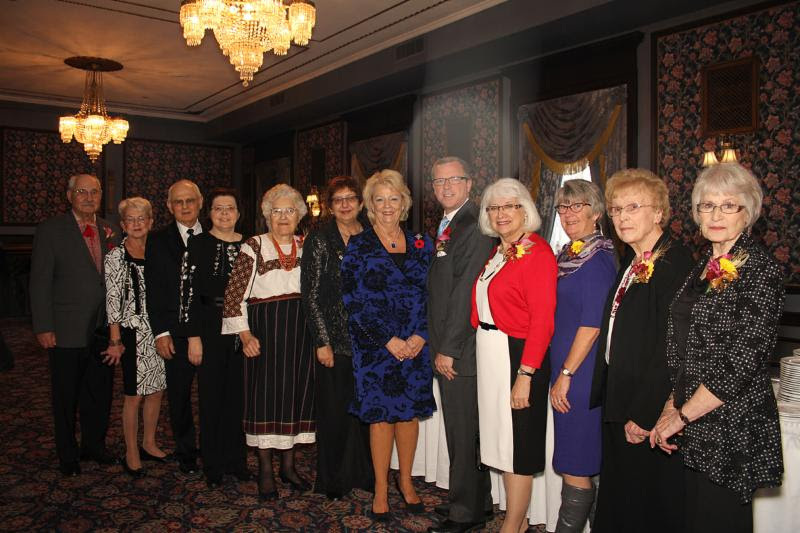 On Saturday October 18, 2014, the Ukrainian Canadian Congress Alberta Provincial Council held the 2014 Hetman Awards in Edmonton Alberta. 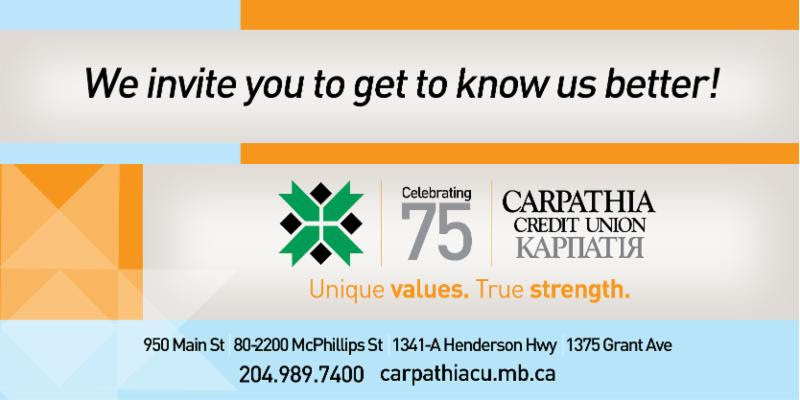 The Ukrainian Canadian Congress would like to congratulate the recipients for this honourable award including the National Executive’s own Mrs. Andrea Kopylech. It is the work of these volunteers and all those that have preceded them over the years that keeps our community strong and our voice loud across the country. Their dedication and will to represent their identity and our community to great lengths shows courage, honour and dignity. The UCBA will strive to maintain a network of lawyers, judges, paralegals and law students of Ukrainian origin in order to create professional opportunities, mentor law students and young lawyers and to help Ukraine develop its legal system. The UCBA will be advocating for the greater Ukrainian Canadian community and will work synergystically with the Ukrainian Canadian Congress and the Ukrainian Canadian Professional and Business Association, as well as their respective initiatives. 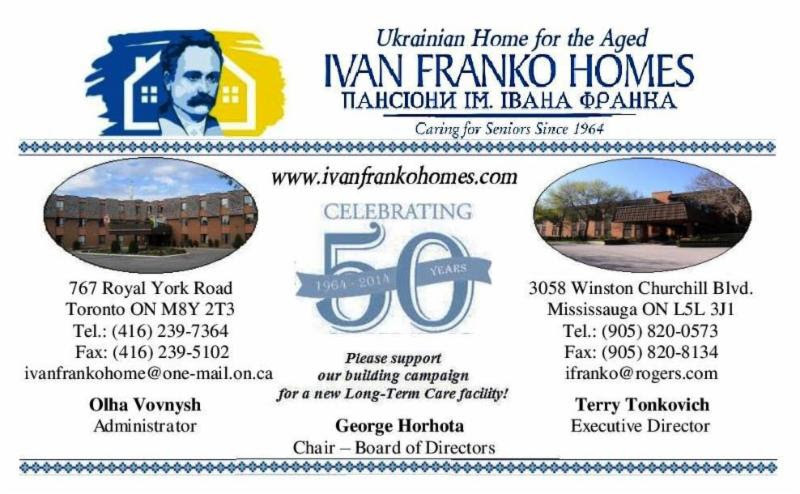 The Ukrainian Canadian Congress would also like to welcome Ivan Franko Homes as the newest sponsor for the UCC Online Bulletin. The UCC kindly thanks all sponsors for their generous donations!